The 15 W Wireless Power Development Kit is currently being developed in cooperation between Würth Elektronik and IDT and includes a Plug & Play Wireless Power solution. The kit also offers bidirectional data communication between the transmitter and the receiver and is Qi compliant. Reserve one of the first Wireless Power 15 W Development Kits with bidirectional data communication now. 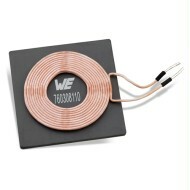 The 15 W Wireless Power Kit can be preordered here. For more information please contact wirelesspower@we-online.com. You can find more reference designs with IDT here.